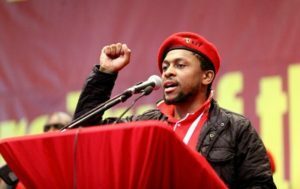 Ndlozi whose full name is Mbuyiseni Quintin Ndlozi was born in the year 1985 in Gauteng, South Africa. He is a South African politician and is also the youngest member of the Economic Freedom Fighters in Parliament and the party’s national spokesperson. Since 30th November 2016: Member at Ad Hoc Joint Committee on Appointment of Board Members to the National Youth Development Agency (Ad Hoc Committees). 30th November 2016: Member at Ad Hoc Committee on the South African Broadcasting Corporation Board Inquiry (Ad Hoc Committees). Ndlozi is believed to be dating actor Mmabatho Montsho.